Colombian air stamp, issued May 15, 1954. With the motif of Nevado del Ruiz. Face value 20 cents. 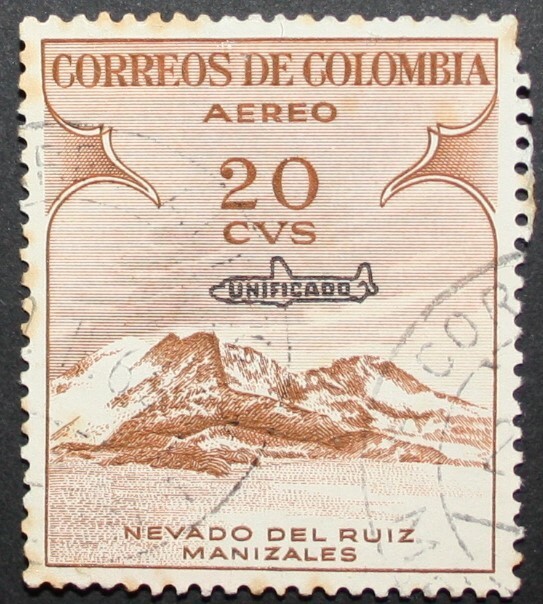 Enabled as “unified” (within the profile of an airplane), ie a second seal was not needed since until late 1958 in Colombia two stamps were needed if the letter was to be flown. Perforation comb 13 and brown. GODO-LUIS COLLECTION, free license with citation of authorship (profesorluisduran). Creative Commons Attribution.